To celebrate the Fourth of July, here’s a 35-second display of nature’s fireworks. These photos were taken in the past 24 hours near the Meadowlands Commission’s headquarters in Lyndhurst — with a few near the carillon on Disposal Road (Amvets Way) in North Arlington. 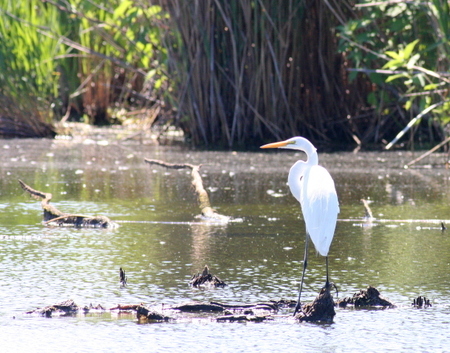 The Kearny marsh is a gem located just off Schuyler Avenue in — where else — Kearny. You access the marsh by turning into Gunnell Oval Park and driving around back. The 300-acre marsh is significant because, as the only freshwater wetlands in the Meadowlands District, it provides a major stopover for migrating waterfowl. This time of year, it is decidedly laid back, with dragonflies a-plenty, painted turtles sunning themselves, and some nifty plants — Meadow salsify and black raspberries. For directions and more information on Kearny Marsh, click here. Click "Continue reading" to see more images and read more about the marsh.